All over beaded ball gown, the color is considered a light ivory. The beads are so beautiful and were hand crafted in designs I requested. Floral applique are all over the dress and romantically flow down toward the middle of the skirt. There are white buttons on the back that stop at the lower back, I used a tool to help do the buttons. There is also a zipper inside the dress-which I loved to help keep me in. Beautiful train that looked fantastic with a cathedral veil. Custom sweetheart was designed for this dress. Very light compared to most beaded ball gowns. 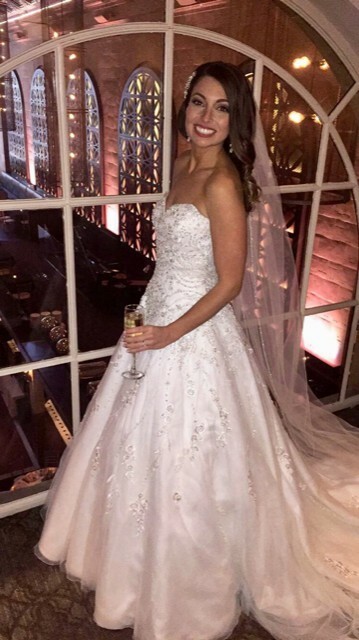 It was the most beautiful wedding dress for me for the best day of my life! I had the dress altered three times to fit perfectly.